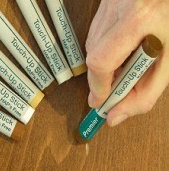 700 Series Capillary Felt Tip Touch-up Markers feature a stain & finish in one package. A quick one step repair for scuffs, scratches or sand­ throughs. Simply remove the cap and use ... no shaking or pressing down on the tip. Premier Capillary Markers contain the stain and the coating so it is not necessary to clear coat after use, although a clear coat can be applied for extra durability. The markers are formulated with state of the art dyes and resins giving excellent adhesion, clarity and colorfastness. They apply smoothly then dry very quickly (in a matter of seconds) to a very durable repair. All components are acid stable and therefore can be used under or over acid catalyzed finishes without concern of burn-out or color change. PREMIER 200 series Valve Action Stain marker stains and seals scratches, worn spots on furniture, wall paneling, picture frames, and leathers. Shake well, remove the cap & press the tip down to feed the product to the tip. The valve marker allows control the amount of marker fluid you apply giving you total control on those complex touch-ups. which are necessary in the whites, off-whites and opaque colors. 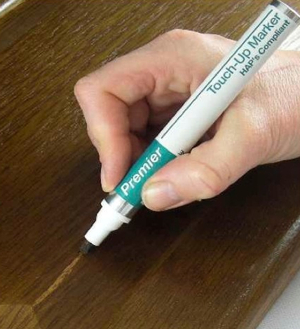 Premier Touch-up Markers contain the stain and the coating all in one so it is not necessary to clear coat after touch­up, although a clear coat can be applied for extra durability. 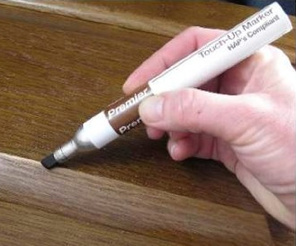 The wax touch-up / fill stick is simple to use for making a cosmetic repair to damage on fine furniture or cabinetry. Premier sticks are manufactured for the industry using the finest waxes and pigments available. To use the product, simply rub the stick back and forth over the void until the void is completely filled. Then remove the excess by either scraping off with a plastic putty knife (credit card) or you can buff off with a soft cotton cloth. ideal for in store or onsite touch-up repairs.